I first experimented with drags, primarily grapples, when I was still catching mostly fox at canine sets in Ohio. A trapped fox on a grapple invariably headed for the nearest cover, and I could count on finding the animal tangled up nearby. But when the coyotes came, it was another story. A coyote may head across open country where there is nothing for a grapple to hook. Where I suspect I may catch a coyote, even if it isn’t necessarily a coyote set, I may instead use a long, heavy tree limb for a drag. I was using a big chunk of limb for a drag at a cat set in the edge of a woods when a coyote got in the trap and instead of heading for the woods, headed across a picked soybean field. Because of the extra-heavy drag, I didn’t have any trouble finding that critter. It was out in the middle of the field, tugging on the drag, moving the limb an inch or two with each lunge. But I sure was glad I hadn’t used a grapple, because there’s not much for a grapple to hook in a picked bean field. Using the right drag for the location, I usually find the animal detained within sight of the set. When I don’t, the first thing I usually do is ride or walk the edge of any adjacent clearing. A coyote on a drag may make it across a clearing, but even a coyote isn’t likely to get far with a drag in the brush. I thought that might be the case last season when I discovered the trap and limb drag missing from a set I’d made at the edge of a 100-acre short grass field. I found some scuff marks in the field, obviously made by the limb, and also coyote tracks heading toward the opposite tree line. I went back and forth along that tree line, but I could not find any more sign. I decided to check the rest of my near sets and then come back to look for the coyote. My next set was in the woods on the other side of the field, and when I got to that tree line, I found a patch of shredded brush that looked like somebody had swung a lawn mower around in there. That’s a sure sign when you’re looking for a critter on a drag. It was obvious the critter had hung up there, if only temporarily. I thought maybe it had pulled out of the trap, but I could not find the trap or the drag. I had made a mistake in the rigging of this particular drag, a stout limb about 4 inches in diameter and 6 feet long. The limb had a crook in the middle, in the shape of a shallow “V,” and I had fastened the trap there, on a 5-foot length of snare cable. I make these cables with a slip loop on the end so I can just slide them over a limb and pull them up tight. If there is any question about the loop holding, I wrap 14-gauge wire over top of it and cinch that tight, too. Typically, I fasten the chain or cable about a fourth of the way down from one end of the limb. This makes the limb drag at an angle, and it usually catches on something. But, I had fastened this one closer to the center, and the V-shape was deflecting off of things instead of hanging up on them. Having freed itself from the first brush tangle, the coyote was on its way to God knows where. Before looking some more for the coyote, I decided to go ahead and check the set, a snare at a culvert I thought cats might be using. As I approached, I saw my limb drag wedged across the mouth of the culvert—and the coyote hiding inside. That coyote had gone pretty near a quarter-mile from where it had been trapped. Even though it had fouled up a perfectly good cat set, I still felt mighty fortunate packing that one back to the truck. I experienced one other major disappearance of a critter on a drag last season. This set was made where an earthen levee had been built across a gully, forming a large pond. I couldn’t tell if the levee was built to create the pond or if it was made to provide a way across the gully. But tracks told me humans weren’t the only critters using the shortcut. The earthen levee connected hay fields surrounded by woods. The top was mowed, and at one end I made a urine set using the weathered root wad from a small uprooted tree. 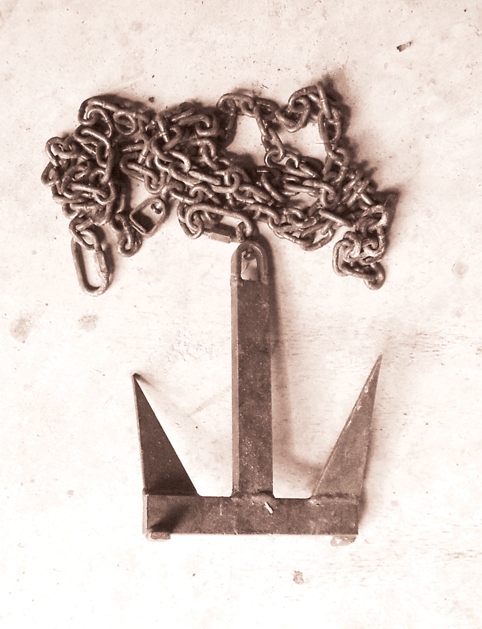 I attached the trap to a relatively heavy 2-pound steel grapple on 8 feet of chain. A couple of days later, the trap and grapple were missing. I’d already caught a number of critters on drags at that same location, and all had tangled up in a cedar thicket on the bank of the levee. I searched the thicket thoroughly within 50 yards of the set, pretty sure a trapped animal couldn’t have gotten any farther than that. But I didn’t see a critter. Nor did I find any broken brush or scuff marks. I went back to the set and crossed to the other side of the levee. There was a faint deer path on the other side of the lane, and I followed that into another tangle of brush and vines. A critter could not have gone far dragging 8 feet of chain and a 2-pound grapple in there, either, and I didn’t see any evidence that one had tried. Next, I got on the four-wheeler and rode around the edges of the hay fields, thinking maybe I had snagged a coyote that had decided to head across country. But I found nothing and decided it was time to take a closer look at the set site to see if I could unravel the mystery. A few feet from the set, high up on a sapling, I found a set of claw marks. Now I knew the trap held a bobcat, and a fairly big one, judging by the height of the marks. A few feet from there, I found a pencil-size sapling with a scuff mark on the bottom. It had not been big enough to hold the grapple and had bent over, letting the grapple slide over top. But the lean of the sapling told me which way the cat had gone­—across the levee towards the lane. With my nose still to the ground, I located some places where the sharp shovels on the grapple had scuffed up grass. Yet all sign seemed to cease at the edge of the lane. I even looked up in the trees thinking the cat might have climbed one of them. By now, I had spent nearly an hour looking for the cat. I finally got a fresh trap and drag out of the ATV carry box and remade the set. I had too many traps out to spend any more time looking that day, but I would continue the search every day when I came back to check the remade set. Before leaving, I decided to take one last look down the deer trail, because one set of scuff marks seemed to go that way—and all of a sudden, there was a cat hopping around in front of me! After I dispatched the cat, I unraveled the grapple and the mystery. The cat had headed across the levee straight for the thick brush. In fact, the grapple was no more than 10 feet from where I had noticed the last bit of sign. But then the cat had hunkered down under the brush and vines and let me walk within 4 feet of it the first time I checked that deer trail. It didn’t move, didn’t growl, just hunkered down and let me walk by. I don’t know why it hadn’t fought the drag harder and torn up some brush. I use a lot of drags on my out-of-state trapline. At home, I am likelier to stake the trap. Several factors go into that decision. Where I trap out of state it is mostly backwoods and brush, the kind of cover I depend upon to detain animals caught on drags. Where I trap in Ohio, there are more open fields, and if there is nothing for a drag to snag, an animal, especially a coyote, may just keep on going. The amount of people living in the area also matters. The more people, the greater the likelihood that one of their free-roaming dogs will get in a set, and I certainly don’t want someone’s pet dog dragging one of my traps around.